Mayor John Bailey addressing attendees at Greenville Elementary School, discussing the future of the North Park Police Department. 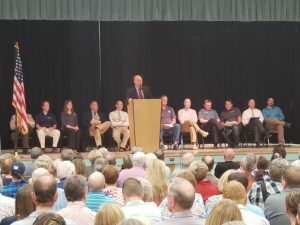 NORTH LOGAN — Hundreds of residents and concerned citizens packed into the Greenville Elementary School gymnasium Wednesday night for a public meeting, discussing the future of law enforcement for the city. The meeting was organized after concerns arose that the city council was considering disbanding the North Park Police Department. Mayor John Bailey acknowledged to the group that the issue had become contentious, partly due to myths that had been circulating through the community. He expressed hope that everyone would be civil and respect each other’s opinions. Bailey explained that no decision had been made yet and they were also scrutinizing other departments, not just law enforcement. He also clarified that Sheriff Chad Jensen did not contact the council, trying to troll for business. 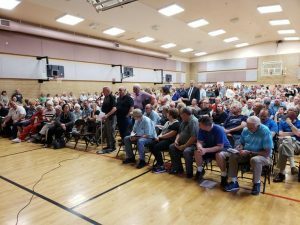 During the comment period, Hyde Park resident Stacey Seamons pleaded with the council to consider what would happen with emergency response times, if they changed to the sheriff’s office. She emotionally praised how North Park officers helped her, when her husband passed away. Most of the people who spoke expressed their desire to keep the police department. Several asked that the council make it a ballot initiative for the upcoming primary election. Citizens lining up to speak during a public meeting at Greenville Elementary School, discussing the future of the North Park Police Department. Gary Morrison, who moved to North Logan 11-years ago, expressed his support for the sheriff’s office. He said, he doesn’t believe the police department will be able to handle the growth happening in the city. After the meeting, several other residents echoed similar support for the sheriff’s office like Morrison. They said they felt intimidated though by the attendees at the meeting, to express their opinions. No decision was made at the conclusion of the meeting. Bailey said the council will take the time to come to a final decision, taking multiple factors into consideration, not just relative costs.